I confess that after seeing The Princess and the Frog (linked to my review and thoughts) I had my doubts about Disney pulling off anymore magnificent classic princess stories. I saw the promos and previews for Tangled though and a new hope was reborn within me! It looked like, maybe just perhaps, Disney was going to tell a classic tale in classic fashion and I was eager to see if this were true. Jonathan and I were both curious enough to make a date night out of this movie and were happily given an opportunity to see it this evening. In short: we both loved it! It's classic Disney (although with something of a Pixar-style animation as opposed to your typical hand drawn cartoon) and a classic fairy tale. They didn't try to make it too modern (until the very end by changing the appearance of Rapunzel - and Jonathan wasn't as bothered by it as I was) and they kept it fairy tale-ish. The movie was humorous with fun songs that helped to tell the story. (I didn't think any of the songs were all that memorable but they were funny and/or complimented the storyline quite well in my opinion.) The lyrics were written by Alan Menken who you might recognize as having given birth to a great many memorable Disney classic songs from movies like The Little Mermaid, Beauty and the Beast and Aladdin. Just seeing his name pop up in the opening credits did me a world of good, I have to tell you! After the credits we just melted into the story and enjoyed it thoroughly. I enjoyed it so much that I walked out and told Jonathan, "I can't think of a SINGLE thing I have any objections to!" (Usually I have a list.) Jonathan then reminded me that there is a brief scene where Flynn Rider (the bad boy/hero of the film) is telling Rapunzel that there comes a time in everyone's life where they are obligated to rebel against their parents. But the scene is so brief that, you see, I had already forgotten it by the time the film was over! That said, that little message is tucked away into the movie but I find that a very easy discussion to have with my kids so I'm not terribly concerned with it. One thing I particularly appreciated was that the "bad guy" of the film, Gothel, is not remarkably scary. Gothel hides Rapunzel away in the tower in order to keep the magical powers in Rapunzel's hair all to herself. Rapunzel's hair as the power to restore health and youth and Gothel uses her to keep alive. (Gothel subscribes to the modern message that we can be young and youthful forever. She would be a plastic surgeon's best friend. Gothel, truly, is afraid to die.) You know how fairy tales end though, right? (At least the Disney-fied ones.) I'm not spoiling anything by saying that the good guys live happily ever after and the bad guys, well, don't. Usually when the bad guy bites the dust in a film, it can be kind of a dark and scary moment. I appreciated the fact that in Tangled it was very obvious that Gothel was about to meet her demise but instead of revealing her face and features to young eyes, Disney cleverly cloaked her so as not to be so startling and disturbing to watch. I really, really appreciated this! I don't see the point in unnecessarily scaring children or filling them with fear and trepidation over a movie and I think I could safely show this to Bookworm1 without issue. It's pretty clean in the "scare department" which is something we generally pay very close attention to! Therefore I must conclude that, at least for us, we loved this film and were thoroughly entertained by it. Glad to see Disney going back to a classic princess story without trying to adapt it to smithereens to "suit a modern audience." It made for a great date night! Have you seen it? Do you plan on it? Love to hear your thoughts if you care to share! Oh good to know! I've wondered if this would be a good one. We'll probably see it when it comes out on DVD. Sounds cute! Too bad about the "rebel" statement, but at least they kept it contained, it sounds like. You should review for Plugged In. You are so right about scary moments. We tend to like Pixar...but they have them too. It seems like most animated movies have parts that need to be fast forwarded through for our girl's eyes. Evan is clueless, but that doesn't mean he should be exposed to them. My husband and I went to see it last Week and really enjoyed it. Stephanie @ Simple Things - Definitely a valid concern. I thought the same thing. And it would have nagged at me tremendously if that had been the case. There's definitely an argument for it (esp. from the previews.) The big "hair fight" scene from the previews (where she throws him out the window tied to a chair) wasn't even in the movie. Still, he is played as a cad at first. Then he is persuaded by Rapunzel's genuineness to be honest himself and ends up doing the right thing in the end. I guess the reason I didn't mind it is because Rapunzel wasn't played off as being the all-powerful woman. Rather, she was portrayed as being ignorant and simplistic, having no clue about the world outside of her tower and everythign frightened her - including grass. And they made her "weak" when it came to exploring the outdoors and in need of protector. It was balanced enough that I didn't mind it. It's not Papa Bear (Berenstein Bears) at any rate and it all works itself out. Oh yes! And speaking of the price - we went to a matinee as well. I couldn't BELIEVE the cost now for an evening showing. I think NOT, thanks! The next movie we'll see in the theaters is Voyage of the Dawn Treader. (I don't mind supporting that one!) Most of the time we just wait for the DVDs. 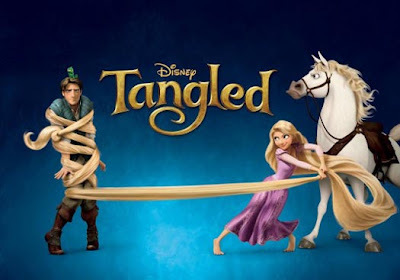 But Tangled was a special treat! I agree with your review completely. My husband and I took our eight year old and four year old daughters to see it last night and we all LOVED it! I can't say the same for Megamind, which used the word frickin not once but two times (I'm not a prude, but for cryin out loud do we have to use not very nice slang words in kids movies)! Carrie~ I really appreciate your review. I wasn't too sure about this one, but now I want to take the kids to see it. :) Thanks for sharing your honest thoughts! LOVE hearing this from you! The previews looked like there could be some innuendo or attitude, but I'm glad it was not objectionable to you -- and yes, I trust you to air them if you had them! Definitely no innuendos and I think Rapunzel's attitude is improperly displayed on the previews and trailers. She's actually quite an innocent in many, many ways in the film. Oh, this looks so fun! I'm thinking this might be out best bet for a first trip to the movie theatre as a fam. Thanks for the review. I really knew nothing about this movie, so I appreciate it! Good to know!! I'll look for this when it comes out on DVD.